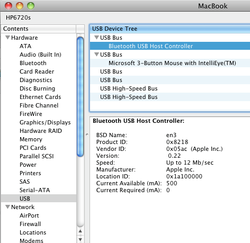 Mac OSX 10.6.5 is released and it works fine on the HP 6720s. You will need to update a couple of kext only. Thanks to juanerson at IM we wont need to bother with plist editing as he has released the needed kext ready to be used. I will be adding the 10.6.5 package to the upload section soon. After you flash your 6720s with the hacked BIOS you might want to rebrand your Broadcom WiFi card so it gets detected as a genuine Apple Airport Extreme card. The method is outlined by Prasys in his BLOG. If you try this running a normal BIOS your card wont pass the whitelist check once is modified! Probably you know that HP "whitelists" certain WiFi cards to work with their systems. It does this by comparing the Vendor ID, Device ID, and SubSystem ID of the inserted card to the ones listed in the BIOS. This is a major problem if you run OSX on your HP as you know the supported WiFi devices are a bit limited under this OS. If your HP shipped with an unsupported card (Intel 3945 for example) you will have to buy (a rather expensive) HP branded replacement in order to make it work. TTAV134 at My Digital Life Forums has released a number of bioses for HP laptops in which the whitelist check routine has been bypassed allowing us to install any WiFi cards (even Apple ones) without problems. This bioses also includes a SLIC2.1 tables for Windows 7. I've added a bios flashing package (machines with Intel x3100 graphics only!) with detailed instructions to the downloads. USE IT AT YOUR OWN RISK! Theres an ongoing development around netkas's fakesmc source. The new features are super-IO chip readings (temp, fan speed, voltages), GPU temp/fan readings for Nvidia cards and GMAx3100, ACPI register readings and CPU temps. The screenshot is from my P5K-VM board using iStat. The kexts are still being actively developed at the moment.